This fun little name craft for kids can be played with again and again so kids can get some repetition along with a great fine motor strengthening boost! One of the most common skills we address with kids in occupational therapy sessions at school (and with our preschoolers at home) is recognizing, sequencing, and writing the letters of their names. We’re always trying to think of activities and projects for kids that target this skill in a new, fresh way. WHAT TO DO: Draw the shape of a caterpillar’s body onto the cardstock and have the child help cut it out. 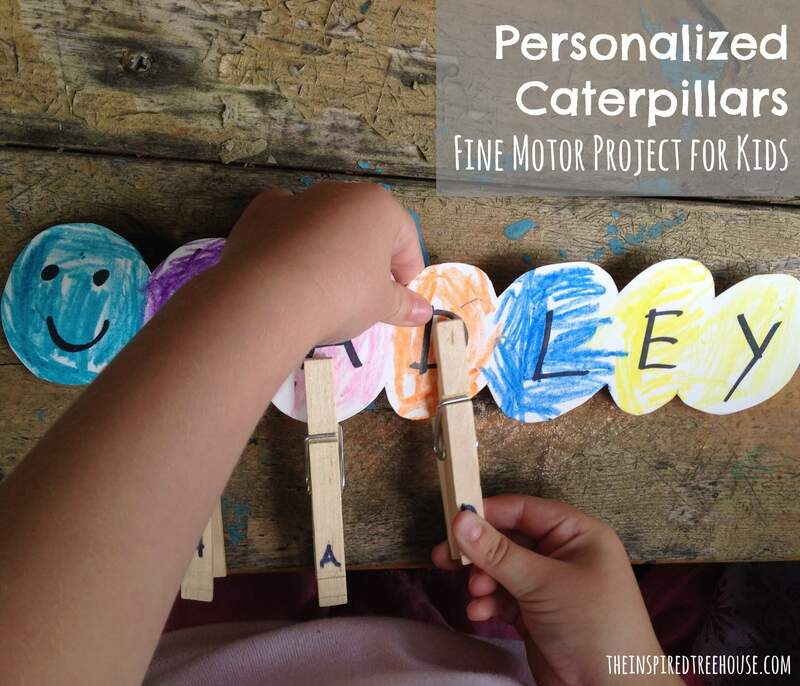 Draw vertical lines on the caterpillar, making a space for each letter of the child’s first name. Write the letters of the child’s name in each of the spaces and write one of the letters of the name on each clothespin (or on pieces of paper glued to the clothespin). Now, tell the child that his caterpillar needs some legs! Have him pinch each clothespin using his Super Fingers and match them to the correct letters on his caterpillar to spell his name! When he’s finished, the caterpillar should be able to stand up on its legs all on its own! 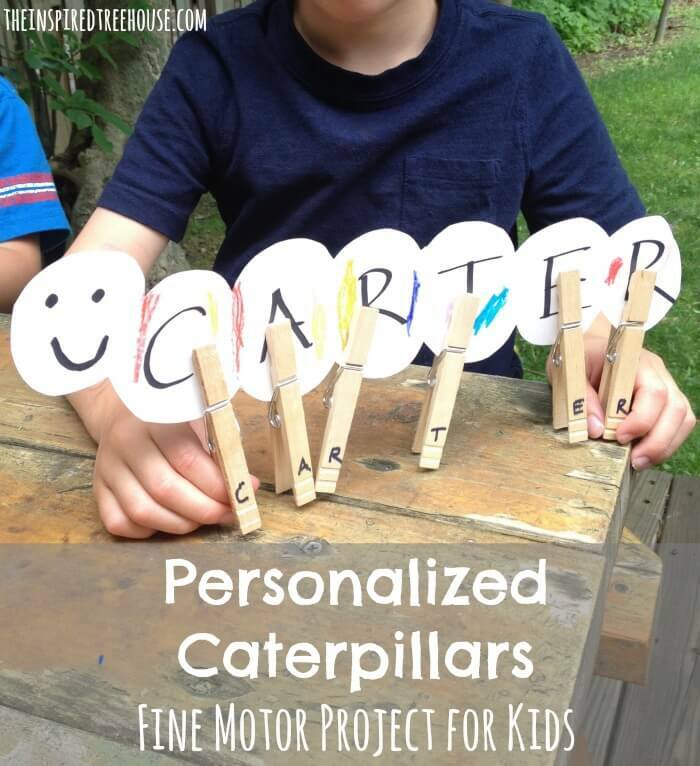 -Once the child has had some practice with this, try making a new caterpillar with blank spaces on the body so the child has to sequence the letters of his name without a model. -Try incorporating other academic concepts. Make several caterpillars with different sight words on them, with clothespins to match. Make a caterpillar with numbers 1-5, or more! Make a super long caterpillar using the whole alphabet! Sign up to receive our newsletter, a weekly roundup of our favorite posts and other great finds from around the web delivered right to your inbox! 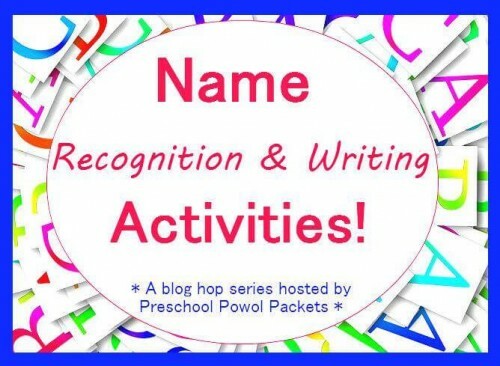 This post is part of the Name Recognition and Writing Series hosted by our friend Carla at Preschool Powol Packets! Be sure to click through to check out some of the other awesome ideas for teaching kids how to recognize and write their names! Looking for more great motor activities for kids? Oh my! That is SO cute! Great idea! How clever! Thank you for hearing. Pinned. oops, sharing I meant, lol!